It was investigated in Japan in 1950s. The l-isomere showed weak analgetic action comparable to codeine and antitussive action far weaker than codeine. The d-isomer showed no such activity but caused seizures in rats. In a small study in 1994 it was compared to clonidine and buprenorphine for the detoxification of methadone patients and found to be inferior to both for this purpose. 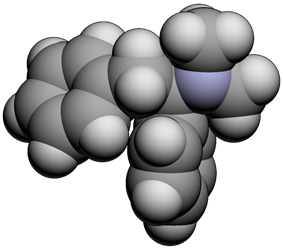 Some related pyrrylphenylethanones had analgetic activity comparable to morphine. Some pyrrole analogues were reported to have analgetic effects comparable to lefetamine and being devoid of neurotoxic properties.